Mom was able to suss out that the recipient’s favorite color is green, and luckily, I had a lovely skein of green handdyed bamboo-merino sock yarn in stash ready to use. 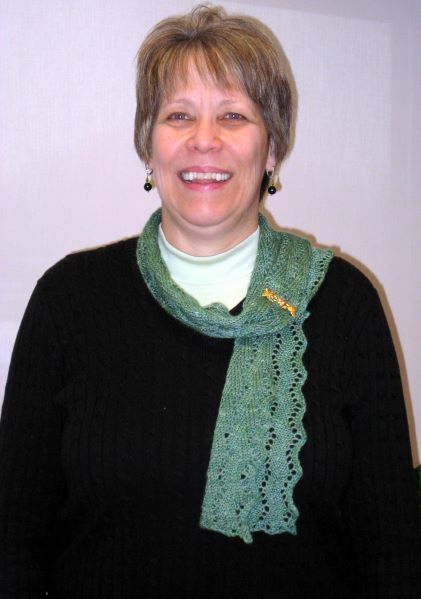 My original plan was to knit the Lace Ribbon Scarf (by Vernoik Avery, Knitty, Spring 2008). 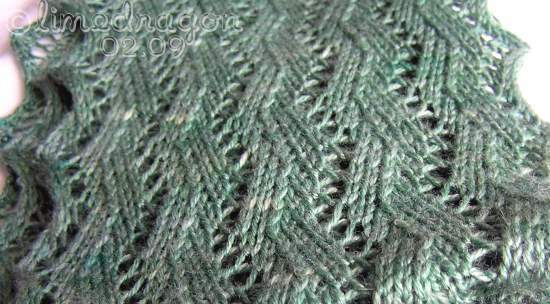 Moments before I cast on, however, I came across Isobel on Ravelry and loved the zig-zag movement of the stitches in the lace pattern, so I decided I would knit that instead. During the first few repeats, I worried that I had made a mistake and that this pattern would be too boring or tedious to work. My progress was very slow during the first two days. 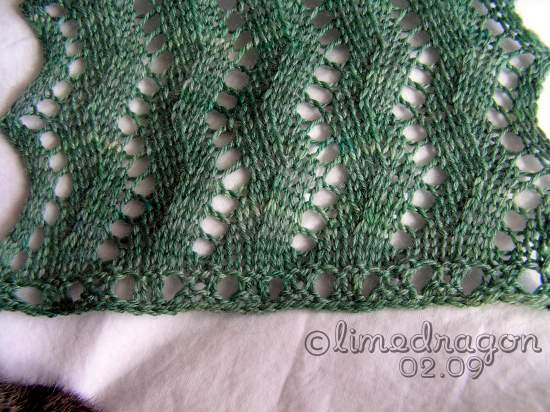 But after that, something clicked, or I must’ve gotten into the "lace zone" and the scarf progressed very quickly. I did add an extra repeat width-wise, because I worried that the scarf would be skinnier than I wanted (unblocked, it was about 5.5" wide). I also worked 33 repeats of the 12-row pattern for a total length of about 45". After a quick soak, I was able to pin out the scarf to about 7.5" wide by 61" long, just right for a modestly-sized scarf. That’s lovely! I, too, like this better than the lace ribbon (which I also like), so I bookmarked the site! 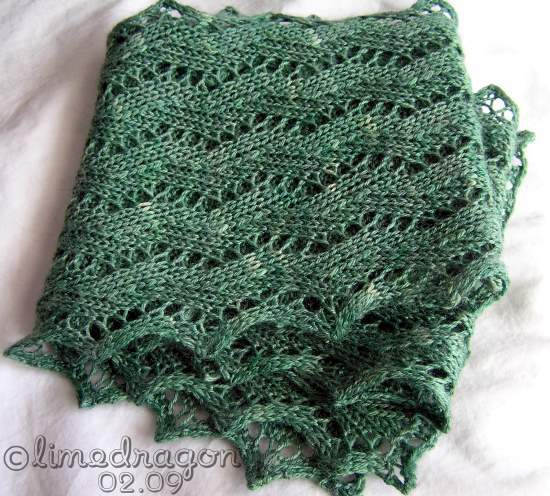 It’s really beautiful… I like the eyelet border at the ends too. Wow, what a beautiful scarf. You are such a generous person! Beautiful! That’s a very nice thank you. That’s a beautiful scarf! I like that shade of green. What a nice idea for a thank you. gorgeous! 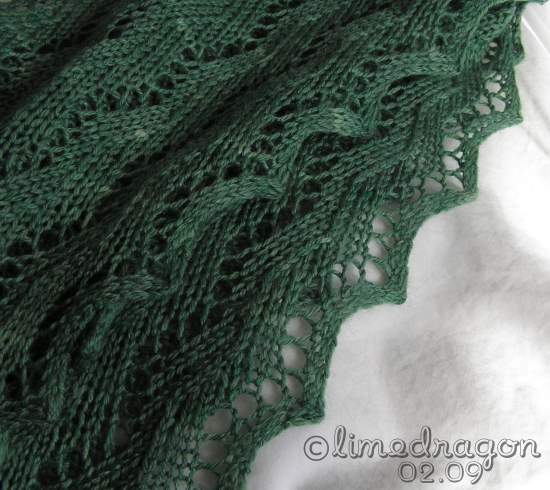 it looks like i’ll be adding yet another pattern to my ever growing queue. That scarf is amazing! Whatr a very kind and original gift. You are truly a talented knitter.